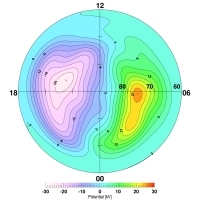 Two papers published in February and July 2007 in Annales Geophysicae have shed new light on the dynamics of convection cells of matter, found at hundreds kilometres altitude over the polar caps. The pattern of these convection cells is intimately linked to the response of the Earth's magnetic environment to solar activity. Six years of data collected in space by the four spacecraft of the Cluster mission were used to derive, for the first time, statistical maps of the convection cells pattern under various solar conditions. The Earth is an island in the Solar System, where life has developed under the protective shield of its magnetic field and atmosphere. However, this magnetic sphere of influence called the magnetosphere is not an hermetic bubble but is continually changing shape under the influence of solar activity. Our Sun is continually blowing charged particles in all directions, the solar wind, which compresses the terrestrial magnetosphere on the Sun side, or dayside, while stretching it into a long tail on the nightside (Image 1). Most of the solar wind material is deflected by the magnetosphere but part of it manages to enter this magnetic shield. Understanding in details the Sun-Earth connection such as the penetration of solar material into the magnetosphere is of crucial importance for both astronauts and space related technologies (GPS signal reception, satellite communications...). One way to monitor this interaction is to study convection cells of a particular state of matter called plasma, over the polar caps, at an altitude of a few hundred kilometres. In this region, called the high-latitude ionosphere, the nature of these plasma cells in terms of their number, shape, size, and location, strongly depends on the response of the magnetosphere to the orientation of the interplanetary magnetic field (IMF) generated by the Sun. In other words, the pattern of polar cap convection cells is a good tracer of the Sun-Earth connection. 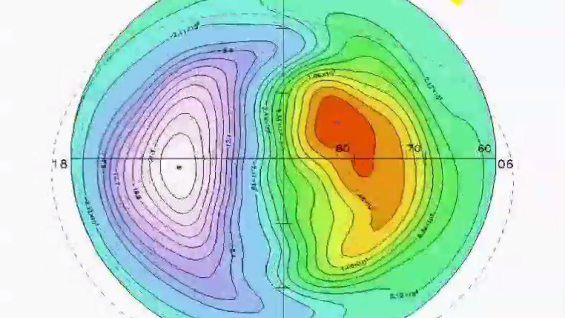 So far, partial convection maps have been produced using ground-based experiments such as the Super Dual Auroral Radar Network (SuperDARN) or by using in-situ measurements of low altitude satellites crossing the polar caps. For the first time, complete convection maps of both hemispheres under various IMF orientations have been derived based on 6 years of data collected by the multi-satellite Cluster mission (Animation 1). One highlight of this work is the presence of two radically different patterns of convection cells: when the IMF is oriented southward two cells are observed (Image 2) while four cells are detected when the IMF is northward (Image 3). On each Cluster spacecraft, an electric field instrument called the Electron Drift Instrument (EDI) recorded the data. The IMF orientation and the solar wind conditions were recorded simultaneously by the NASA Advanced Composition Explorer (ACE) spacecraft located in the solar wind, in between the Sun and the Earth, at roughly 1.5 million kilometres distance from the Earth. 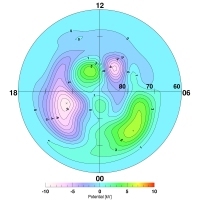 The almost 6000 hours of Cluster data used in this statistical study were collected in the magnetosphere and mapped down to the polar cap ionospheres using a magnetic field model under the assumption that the magnetic field lines are equipotentials. "Comparison with published statistical results based on SuperDARN radar and low-altitude satellite measurements shows excellent agreement between the average convection patterns. This agreement lends credence to the validity of the assumption underlying the mapping of the EDI data, namely that magnetic field lines are equipotentials," says Dr. Stein Haaland, scientist at the Max-Planck-Institut für extraterrestrische Physik (Garching, Germany) and the University of Bergen (Norway). Dr. Haaland is the lead author of this statistical study published 01 February 2007 in Annales Geophysicae. A complementary paper led by Dr. Förster from GeoForschungsZentrum Potsdam (Germany) was published 30 July 2007 in the same journal. "This result shows how valuable many years of data collected by the four Cluster spacecraft are to deepen our understanding of the Sun-Earth connection. This is a great achievement of the Cluster mission," says Philippe Escoubet, project scientist of the Cluster and the Double Star mission at the European Space Agency. Haaland, S.E., G. Paschmann, M. Förster, J.M. Quinn, R.B. Torbert, C.E. McIlwain, H. Vaith, P.A. Puhl-Quinn, and C.A. Kletzing, High-latitude plasma convection from Cluster EDI measurements: method and IMF-dependence, Annales Geophysicae, 25, 239-253, 2007. Förster, M., G. Paschmann, S. E. Haaland, J. M. Quinn, R. B. Torbert, H. Vaith, and C. A. Kletzing, High-latitude plasma convection from Cluster EDI: variances and solar wind correlations, Ann. Geophys., 25, 1691-1707, 2007.